With installs after v3.00 you can use native package manager commands to find installed version. If your installation is below v3.00 you will see a No such file or directory response. Required portal settings during installation. Please make note of the following settings while going through the CLI installation prompts. We currently install rule sets based on the current device configuration. We break them down to two major methods, bridge & router. Important: Caution: Without additional firewall rules to block external SSH access it is not recommended to deploy the device outside the firewall. 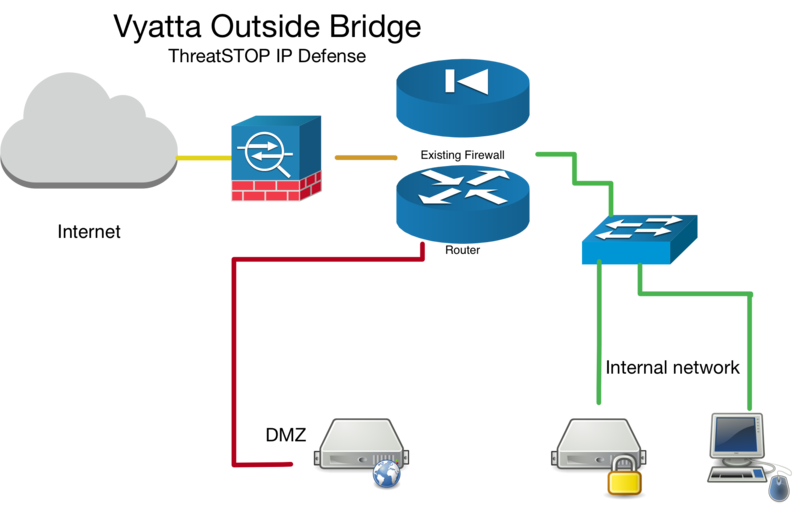 In bridge mode, we only create inbound & local firewall rule sets as traffic always travels in to the virtual brX interface. You can apply the firewall rule set outbound as well, but our testing shows this is unnecessary as the inbound rule will drop the traffic on the edge (more efficient). Please refer to your devices manual for proper firewall configuration as versions may have slightly different implementations of these rules. It is preferable to install the ThreatSTOP device “inside” the firewall/router (see Vyatta Inside Bridge diagram below) if it is doing NAT to track down infected machines on your network. Otherwise the Vyatta will only see the single IP from the next hop instead of the true source node’s IP. If you have setup your device as a router, we will ask for an interface and corresponding interface-type. In router mode this means of the external / edge interface (it is more efficient to drop traffic on the outset). If your configuration has multiple external interfaces you should still choose “router” as the mode of operation. Additionally, you may have to apply the firewall rule set manually to those additional interfaces after completing a successful installation. You can see the firewall setup commands by running show configuration commands |grep interfaces | grep firewall. Most customers with multiple external interfaces run bonding / aggregated interfaces, in which case the interfaces are collapsed under a single virtual interface e.g. bondX (x can be 0-23) and interface-type bonding. Please refer to your devices manual for proper configuration as different operating systems / versions may have slightly different implementations of aggregate interfaces. Please refer to your devices official documentation to ensure PPPOE is supported before attempting to use this feature. If your device supports PPPOE you will need to specify the PPPOE instance / unit number at time of install. For web automation this means expanding the advanced settings section and typing in your PPPOE instance / unit number (0 in most cases unless you have several configurations setup). To identify your PPPOE instance number check for in either show interfaces pppoe or show configuration commands. You will be looking for pppoe 0 which tells you your instance / unit # is ‘0’. sample output of show configuration commands, here we also see the instance / unit number is ‘0’. set interface ethernet eth0 description "DSL Modem"
If you have setup your device as a network bridge. We will ask for an interface and corresponding interface-type. In bridge mode this means of the virtual bridge interface brX (X can be 0-999). To see what your system has configured run show interfaces. To ensure your bridge device only needs inbound & local firewall rule sets, test traffic to a known bad host in both directions. 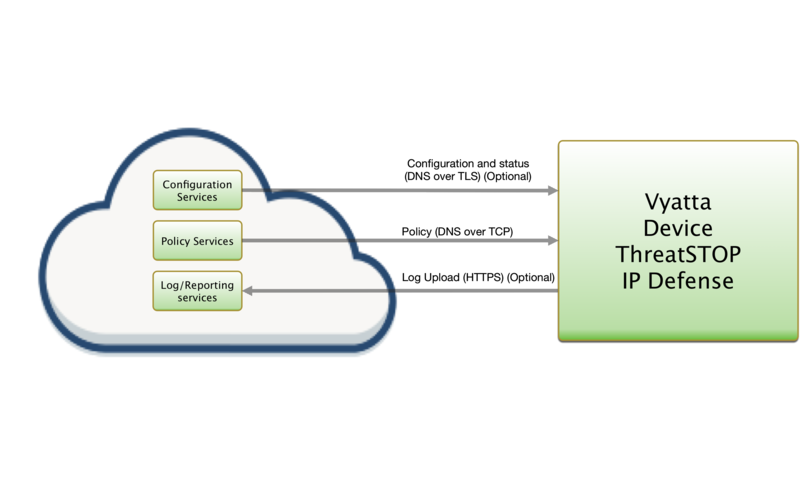 The following logging demonstrates traffic being dropped by the firewall rule-set in both directions by the TS-inbound firewall rule set. There a many factors when it comes to positioning firewall rules in a rule set. While you are able to place our ThreatSTOP rules anywhere from 1-9997 we recommend you put them near the top to drop unwanted traffic at the edge of your network to not tie up additional resources. Our default of 10 has a few pre-allocated spots in case you need whitelist network groups or bypass our filter. Important: If you are installing our service with a pre-defined / existing firewall rule set, pay special attention to the rule offset number. For example, if you choose rule offset position 10 and you already had something defined there, it will be over-written. When installing the ThreatSTOP service on multiple devices you will have to run through creation in the portal and on device setup on each device separately. Some Vyatta based devices do support various HA protocols such as VRRP, or Clustering. We recommend you setup each device as a separate device in the portal and go through the on device configuration just as a normal single device. This way they get unique TDID’s and we can later identify which device reported the IOC hit. Device added & configured via the admin portal. Vyatta based device setup as either a router or a network bridge. SSH access to the Vyatta device. If you are installing Vyatta / VyOS onto hardware or a virtual machine, we recommend the following specifications. Memory 1GB for testing / 512MB or less can be used unless you are planning on using lots of features. Hard Drive 4GB should more than cover both the OS and the device integration. Note: You should also ensure that the device has a default gateway and name server configured. The Vyatta device should be allowed to communicate through port 53. If port 53 is unusable, or otherwise unavailable, it’s also possible to use port 5353. During this step, you will create a device entry on the Admin Portal. You will select a device type and enter the configuration settings. A minimum configuration only requires a handful of settings but optional, advanced settings are also available. The Admin Portal will display a form to enter the device settings described below. Nickname: this is a mnemonic name used to identify the device. It can be set to any string (A-Z, 0-9, - and _). If you create multiple device entries, each entry must have a unique nickname. The Nickname will be used to identify the device on the device and in the Reporting user interface. You’ll need to add the repository key as we sign the debian packages for safety and security. Log into your device via SSH and start a configuration session by typing configure. Type or copy & paste the following commands to add the ThreatSTOP software repository. The ThreatSTOP on device software will download via aptitude package manager. Depending on the OS release you may have other dependancies as well. We try to host all required dependancies such as dnsutils. However, if you are unable to install our service due to this, please contact support. Important: If you had a previous ThreatSTOP installation already configured you will be prompted to uninstall it during the installation of the new software. This is required as the newest release has many changes from previous versions. We will copy over the configuration file and attempt to re-use any compatible settings. Note: While running apt-get update you may see some failures from previously included Vyatta software repositories that are no longer functional. After installation you will be able to configure the device via the tsadmin add command. There are two main methods to configure the device. Manually using the CLI, using the tsadmin add command will guide you through setting up the device via a series of prompts described here. Web Automation, also using the tsadmin add --type=auto command along with some extra parameters will configure ThreatSTOP IP Defense service by fetching settings from our servers to complete integration on device. This document covers the 1.) CLI method. SSH into the Vyatta device as the default admin account. The CLI installation will prompt you for the following settings. Please have them ready along with device id, block & allow lists available here. Device ID: This is the device id or TDID given in the quick settings section or referenced in the portal. Operation mode: This describes the current devices configuration, router or bridge. Prefix: This is a prefix we prepend to allow / block ipset groups. We recommend keeping this extremely short (no more than 5 characters). Interface name: This is the interface you would like to apply the policy to. To see a list of available interfaces run show interfaces. Interface type: This describes the type of interface defined above. To see a list of available interfaces types run show interfaces ?. Inbound rule set name: This is the name we setup in the device for filtering inbound traffic. It’s recommended to keep this name short (less than 20 characters). Outbound rule set name: This is the name we setup in the device for filtering outbound traffic. It’s recommended to keep this name short (less than 20 characters). Local rule set name: This is the name we setup in the device for filtering local traffic (traffic destined for the device itself). Local traffic is defined as traffic destined for the device itself. It’s recommended to keep this name short (less than 20 characters). Rule set offset number: This rule offset number is used to position our block & allow rules in the policy. 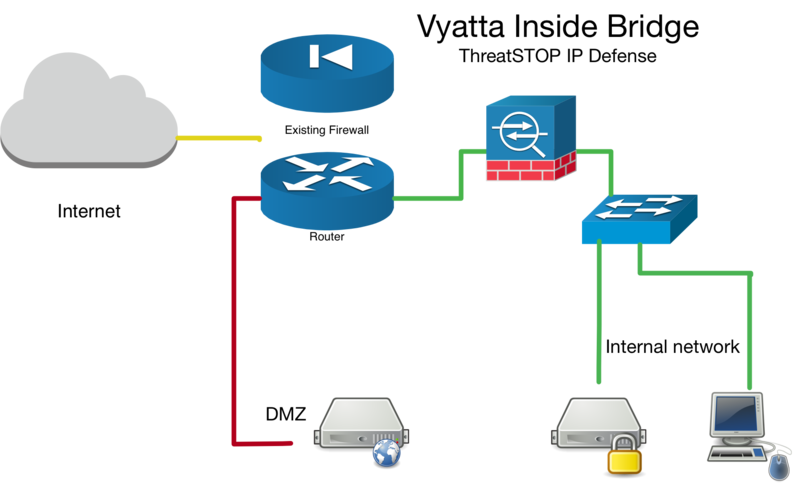 See Positioning firewall rules section above for more details. Default actions for filewall rules: This setting allows you to choose whether we setup a default action for the firewall rule sets or not. Important: It is HIGHLY recommended you set this to ‘yes’ if you are not using a previously existing firewall rule set. Setting this to ‘No’ without having already setup default actions will result in loss of communication to the device as each firewall rule set has an implicit ‘Drop’ rule. Block list: This is the ThreatSTOP block list given in the quick settings section or referenced in the portal. Allow list: This is the ThreatSTOP allow list given in the quick settings section or referenced in the portal. Maximum Policy Size: Option limit on the number of entries in the policy. If the policy becomes larger than this setting, the device will truncate it down to the Maximum Policy Size. DNS Port: The device uses TCP Port 53 (outbound connections) to retrieve policy data. If this port is blocked or filtered (for example, networks using a DNS Application Layer Gateway), use this setting to switch to TCP Port 5353. PPPOE: This is the PPPOE instance / unit number if PPPOE is used. See PPPOE section above for more details. After the initial configuration questions you will prompted to confirm “deploying settings”. It will install all crontab, rc.local, device configuration commands required to configure the device. If you would like to manually deploy these settings see the section manually deploying settings below for more details. Finally, you will be asked if you wish to download the policy now. It is safe to do so if it’s been more than 15 minutes since you’ve added the device in the portal. If you choose not to download the policy now, it will be automatically downloaded in one hour via the crontab entry. Proceed to Step 5. Testing your configuration. Only go through this section if you chose not to deploy settings by typing ‘n’ during tsadmin add setup for step 4-4 above. Choosing not to deploy the settings will create the files necessary to install it yourself only if it can detect the logging system. Be sure to run step A. first. If you finished the setup without running Step A. run the setup again answering the same settings. # TO BE RUN PRIOR to selecting 'N' to the deploy settings confirmation prompt. Now apply the rules located in configuration /opt/threatstop/configure.route.sh or /opt/threatstop/configure.bridge.sh depending on setup. Examine and install /opt/threatstop/crontab to root’s crontab. Examine and install /opt/threatstop/user_crontab to the admin account’s crontab. Examine and install /opt/threatstop/rc.local to the admin account’s crontab. To test your integration to ensure proper functionality we will attempt to ping a known bad host added to most of our IP Defense policies (bad.threatstop.com / 64.87.3.133). You should see traffic being properly filtered as shown below. PING 64.87.3.133 (64.87.3.133) 56(84) bytes of data. Now we will check to ensure we are logging that filtered traffic. You should see some log lines reporting blocks similar to those shown below. If you see the logging lines and blocked traffic, Congratulations, you’ve successfully installed IP Defense! Your first logs should be visible on the portal in 15min to 2 hours depending on the cycle. You can manually send logs by doing the following. Depending on your installed OS the output of the commands below may differ, but this should still serve as a general guide. tsadmin has several sub commands to perform various functions outlined below. Sub commands are interpreted differently by the tsadmin & do not have a -- before them. add The add command install & configures the ThreatSTOP service on the device. remove This command removes the ThreatSTOP integration from the device. update This command forces the device to update it’s policy as well as check for new settings if web automation installation is used. show This command shows the configured settings. version This command shows the current version of ts-vyatta package. logs This command forces logs to be sent to ThreatSTOP as well as restarting logging facilities if needed. This will tell you if your public IP has been allowed to access the policy. The same script get triggered when removing the software via aptitude by running sudo apt-get remove ts-vyatta. In both cases your config file will be left behind in /opt/threatstop/threatstop.conf incase you wish to re-install.